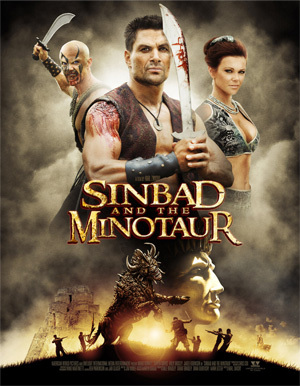 Synopsis: In this re-imagining of Greek and Arabic folk tales, legendary voyager Sinbad (Manu Bennett, Spartacus: Blood and Sand) and his hearty crew of sailors and adventurers seek a long lost treasure. Sinbad, armed with rumors of ancient gold, finds himself sneaking into the desert camp of the evil sorcerer Al-Jibar. Hidden among the many relics is an ivory scroll case containing the logs of the pirate Captain Minos which will lead Sinbad to the golden head of the Colossus of Rhodes. Also in Al-Jibar’s tent, Sinbad finds the captured princess Tara, taken and forced into Al-Jibar’s harem. When a guard raises the alarm, Sinbad fights and escapes with both the scroll case and Tara in tow. Rounding up his motley crew, Sinbad, and the newest crew member Tara, set sail for the island hiding place of the treasure. Following in hot pursuit is an angry and humiliated Al-Jibar. On arrival Sinbad and crew find the island’s villagers aloof and strangely bemused. Deciphering Captain Minos’ journals, they discover an underground labyrinth, but upon entering find that it’s not only booby-trapped, but home to the monstrous and fearsome Minotaur. Sinbad and his band escape the labyrinth, but with the loss of a friend and crewmember. But Al-Jibar too has landed on the island with his soldiers and henchmen seeking vengeance. The cursed island villagers go mad, sprouting horns, trying to kill the intruders at the behest of the now woken Minotaur. Beset on all sides, can Sinbad recover the Colossus’ golden head, win Tara’s heart, and get himself and his crew off the island alive?